Hermiston first baseman Findley connects with a pitch during the first home game of the season against the Post Falls Trojans, Idaho on Friday, March 20, 2009. 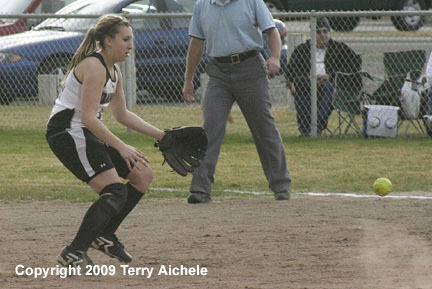 HERMISTON - The Hermiston Bulldog softball team dropped a double header to Post Falls, Idaho on Friday, March 20, 2009. Hermiston struggled in the first game losing it 6-1. The Bulldogs led in the second game until the top of the seventh when the Trojans scored four runs to take the lead. Hermiston couldn't come back in the bottom of the seventh and ended up losing 9-6. It's early in the season and with a young players Hermiston has a lot of potential for improvement over the coming weeks. Lindzey Ramos pitched the first game and Lindsey Walchli pitched the second game for the Bulldogs. They worked hard and showed good control. Post Falls scored first in the top of the third inning when three runs scored on a hit to deep left field. Then a Trojan scored from third on a pass ball to take a 4-0 lead at the end of the third inning. Post Falls next scored on a pop fly just behind second allowing their runner to score giving them the 5-0 lead. Post Falls scored in the top of the sixth when a hit to center field scored a runner from second base to take a 6-0 lead. 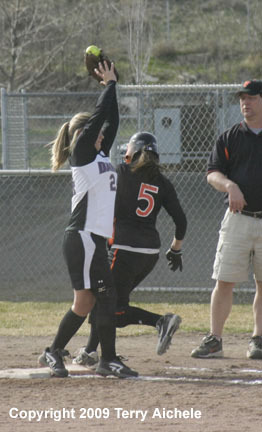 Hermiston finally scored in the bottom of the seventh when Heyne scored on a hit by Andrea Waters. Post Falls won the first game 6-1. Game 2 Hermiston took the lead in the first inning 3-0. The Bulldogs continued scoring in the third inning when firstbaseman Findley scored on a hit to center field by Lindzey Ramos. Then Padilla scored on a groundout by Lindsay Walchli giving Hermiston the 5-0 lead. Post Falls came alive in the top of the fifth inning when they scored on long shot to left field and a grounder to center field. Hermiston scored in the bottom of the fifth when Amanda Bevington when Ramos popped to second base to stretch the Bulldog's lead to 6-2. Post Falls fired up their offense in the top of the sixth. A hard hit to the short stop drove in the first Trojan run. Then a few minutes later two runs came in on a play at first closing the score to 6-5. 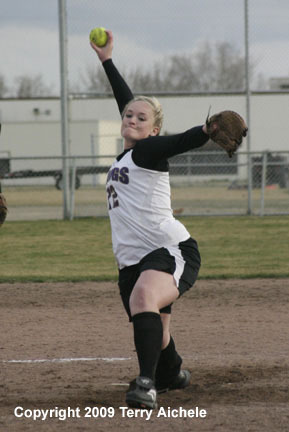 LEFT - Hermiston's Lindzey Ramos was the Bulldog pitcher during the first game on Friday, March 20, 2009. RIGHT - Hermiston shortstop Flyg catches a fly during the first game. LEFT - Hermiston firstbaseman Findley makes a tag for an out. 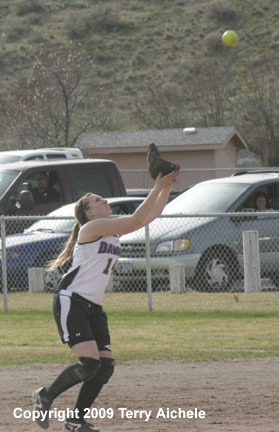 RIGHT - Andrea Waters of Hermiston catches a fly. 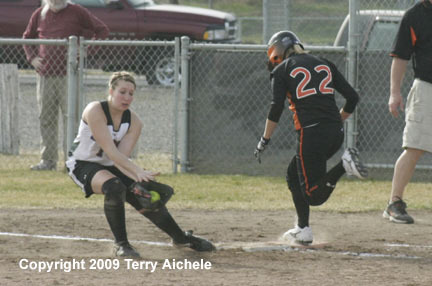 LEFT - Hermiston's secondbaseman, Amanda Bevington covers first on a bunt layed down by a Trojan. 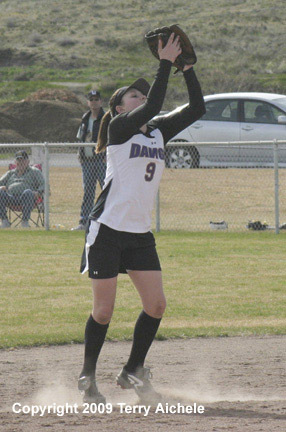 RIGHT - Amanda Bevington of Hermiston moves to catch a fly ball. 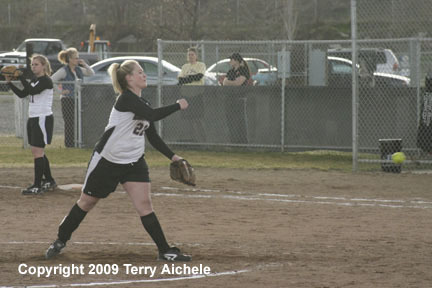 LEFT - Lindsey Walchli pitched for Hermiston in the second game of the double header on Friday, March 20, 2009. 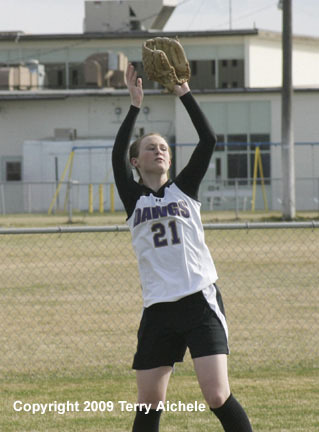 RIGHT - Amanda Bevington of Hermiston prepares to field a grounder during a game on Friday. 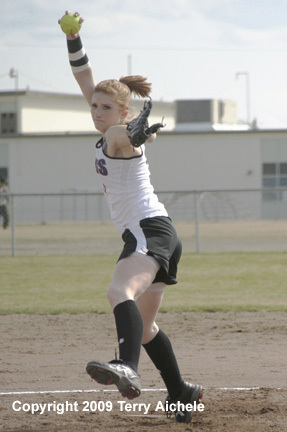 LEFT - Maloree Moss of Hermiston prepares to throw the ball after fielding a hit in the outfield. 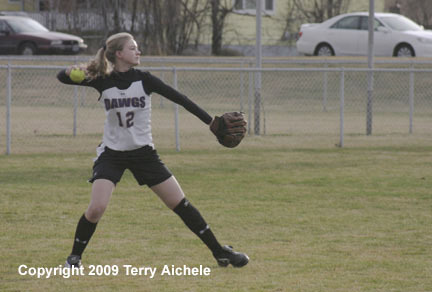 RIGHT - Lindsay Walchli of Hermiston pitched the second game.